Jennifer Boyden is the author of The Mouths of Grazing Things, selected by Robert Pinsky as winner of the Brittingham Prize in Poetry in 2010. Her second book, The Deliverable Future, won the Four Lakes Prize in Poetry and is forthcoming from the University of Wisconsin Press. 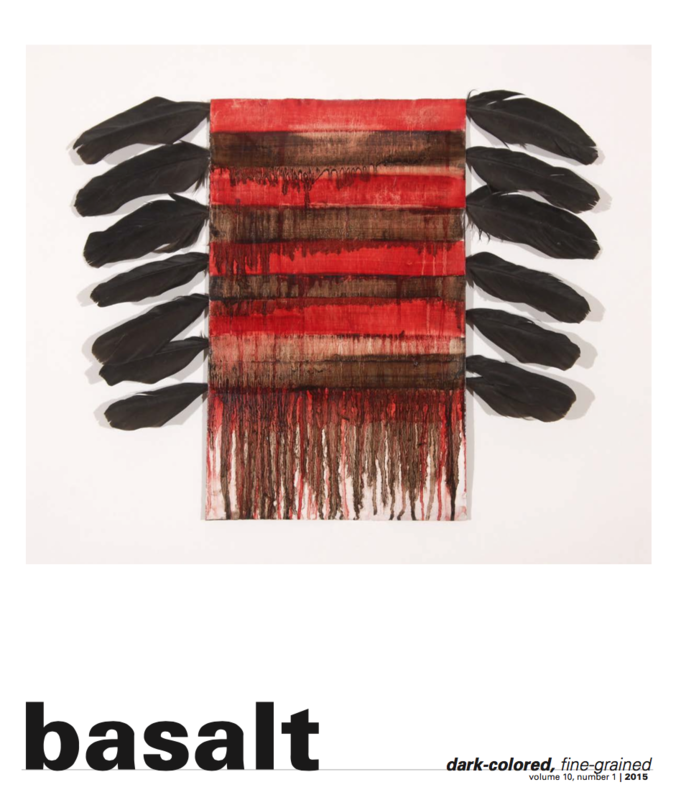 [A number of poems from her new collection will appear in the Spring 2013 print issue of basalt.—Ed.] She has been awarded the PEN Northwest Wilderness Writing Residency and has taught at numerous institutions, including Walla Walla Community College, Whitman College, the Sitka Center for the Arts and Ecology and Soochow University in Suzhou, China. She is a frequent collaborator with visual artists and is currently in the beginning stages of creating a new residency program called Grass Mountain to be located on the Oregon Coast. Jennifer and I conducted this interview via email in late November, 2012. First, I wonder if you could talk a little about how you came to poetry. What sparked your commitment to writing poems that focus so heavily on environmental issues and the natural world? In terms of coming to poetry, I guess it was just the first language I experienced that felt electric and direct, it made sense. My friends joke about my near-total inability to make small talk, and poetry is nothing if not also devoid of that ability. My poems focus on environmental issues because we live in a dying world, and part of how I understand my responsibility as a moral being is that I don’t feel like I can look away from that. The earth’s plight is a tragedy I am intimately involved with as both an individual and a cultural product. There’s just such a lot of it to reckon with, and on so many levels—every one of them a tension between danger and beauty, tenderness and violence. Kid toys with lead, Monsanto crops that are genetic nightmares, toxic breast milk, shopping as a pastime, clearcuts that are prelude to landslides, our old computers piling up in China where the metals leach into and wreck the water and soil, and plastic tops of organic milk that end up floating in the ocean where albatross scoop it up and feed it to their chicks until the chicks die, simultaneously stuffed with and choking on plastic. This is all just for starters. I do understand that there are other things to write about, but all neural pathways seem to lead to an environment-related unease. But this is all thinky stuff. I also find that my ear responds to the sounds and rhythms of words left over from my days of thinking I’d grow up to be a biologist or naturalist. I like the language of forest, fur, teeth, and water—and how that stuff pushes up against the other world. I’ve read your first book, The Mouths of Grazing Things, several times now, and I continue to be struck by the momentum you achieve and the risks those poems take. Your writing is so fearless. Has winning the Brittingham Prize for that book changed your life or the way you now approach your work? I sent that book out for about ten years. Almost non-stop. I understood that at some point if it didn’t get accepted, I’d likely need to face a different reality. But then I’d think that before I accepted that other possibility, which was that I should stop writing and dedicate myself to something else, I should send it out again. Winning the Brittingham Prize validated my belief in my work as well as gave me permission to dedicate myself to poetry and writing. One of the simultaneously marvelous and bewildering experiences of having been awarded that prize was that nothing externally noticeable changed in my life, but internally I suddenly felt I had a lot more permission to dedicate myself to writing. I’ve taken that permission pretty seriously, perhaps to an extreme. I’ve recently quit a tenured position because it did not leave me with significant enough chunks of time to write or think. To me, this is an important declaration of what I value. Some writers abhor this question, but what’s your next project? Another book of poetry, or something else altogether? For better or worse, I have several projects up next or ongoing. My second book of poetry is coming out in February under the University of Wisconsin’s Four Lakes Prize (your pal David Clewell’s book Taken Somehow by Surprise was the inaugural book in this series). It’s a much more environmentally agitated/ urgent book, very different from the first, and I like the sharper, less patient, ever hopeful voice. I also have a book of essays I’d love to wrap up, but it’s a book about walking, and my walks keep getting longer and longer. I have finally accepted that whatever it is that I need to walk out of my system will take a very, very long time, so that book of essays will just have to be patient. As far as I can tell, I think the walking essays are my way of trying to understand the shape of the post-9/11 world, but for all the miles I’ve walked, I don’t think I’ve gotten any closer—maybe I should start running to get there faster? And then there’s the novel. Actually, two of them: one completed and one that’s growing pretty insistent, but I can’t dive into it until I wrap up my teaching position in a few weeks. Beyond writing there is the gigantic project I’m excited about, which is to move to Oregon where I’ll be a writer-in-residence for a year before co-directing a new collaborative art, ecology, and writing program. So there’s all that, as well as the hope that this will leave some time to improve my fishing. I know you recently spent some time teaching in Suzhou, China, and that you lived there with your family. How did you end up in China, and what was it like to live as a poet in what seems like such a proscriptive society? My family and I went to Suzhou, China because it was time to evaluate what we were up to in Walla Walla—how it tied into our larger ideas of how we wanted to spend our time and what we wanted to be devoted to. We needed enough distance to be objective, and we couldn’t really get much further than China. Fortunately, my husband is fluent in Mandarin and has friends in Suzhou, so the move wasn’t as crazy as it sounds. Plus, I wanted to hang out in the bamboo groves of Li Po and Tu Fu’s old haunts. I found living there harrowing, incredible, and relentless, but ultimately galvanizing. My students there often matter-of-factly stated they had no hopes of choosing their own academic paths, careers, regions to which they would be assigned, and so on. Some of them said they hoped to marry for love, but they doubted it would be possible. I can’t pretend to understand the nuances of Chinese culture, but I understand very clearly within myself when I am surrounded by paralyzed will, fear, and feelings of futility. I understand that when there is no nature left, there is no way to understand it, much less try to protect it and that this is also a form of brutality—to cut people from their own ground and to separate them from the sky. Sometimes when I proposed discussion topics, students would tell me that certain topics were too sensitive to discuss—things that to me seemed pretty basic. My daughter is nine, so we spent a lot of time talking about what it means to have or not have freedom of expression. Somewhere along the way in these talks, we determined that, when we got back to the United States, because we would have freedom to make and to say things, we must. The simplicity of that framework changed our lives: because we can, we must. That was it. In the context of China (and since), this construct makes sense: we need to be more active as writers and artists and thinkers because we can. That’s what I mean when I say it was ultimately galvanizing. And once we’d made that decision and I knew it meant I’d have to leave the security of my job, other things suddenly opened up that I’m much more excited about, much as I’ll miss the place and people we’ve built relationships with for the past decade. It sounds like the atmosphere in China had a profound effect on you as a writer and teacher—and as a mother too. No surprise here, I’m sure, but Chinese education is a lot about conformity. For example, in a grade school art class a teacher might want students to draw a house. She would display a house that she drew, and would walk around the room pointing out where students’ houses went “wrong”—basically, where they didn’t look exactly like hers. The house that matches hers most closely would get hung up as a form of praise. Most of my students seemed wrung out by their educations and the insanely intense years of high school where it is normal to study from 6 a.m. until midnight every single day for four years, to the exclusion of vacations, hanging out, seeing a movie, or anything else that might compromise their chances of getting into university. They are valued more for their class rank than for their individuality. By the time they get to university, they are exhausted and cynical about whether it was all worth losing their childhoods over. Most students have no say in choosing their own majors, so even some of my Ph.D. students lacked the critical connection to content that’s so necessary in asking questions and recognizing a spark of potential in not knowing the answer. Because of this system, I spent a lot of time working to connect students’ interests to different areas of meaning within their literary disciplines or, for undergraduate students, in finding ways to apply their skills that felt rewarding. I guess this isn’t all that different from what I do as a teacher in the US, but I had to do it through a different cultural lens, so it required a different kind of approach which I found simultaneously intriguing and exhausting. Also, my daughter went to a local Chinese school, and I wanted to support her creativity and imagination. She made a giant series of watercolor paintings, and we hung her work up gallery style in our apartment building and had an opening that we invited friends and students to. The students kept asking to see the “original” paintings that my daughter had copied from, and then were confused when I explained the paintings were the original. Then they wanted to know how anyone would be able to tell if the paintings were any good if we couldn’t see how closely it matched. For me, that experience was an extremely cogent articulation of cultural differences in understanding the role of creativity. It helped to frame what I feel so urgently now, which is that creativity must be understood as normative behavior, and that cultivating this for myself and others is essential. You’ve been living and teaching in Walla Walla, Washington for several years now, but you’re about to relocate to the Oregon Coast in order to start a collaborative art, ecology, and writing program called Grass Mountain. What led to the genesis of this project? When I was a freshman in college, I called home to find my parents’ number disconnected. They’d moved from the small farm where I’d grown up to a nearby suburb, and they hadn’t told me! It’s likely they’d told one of my siblings twice so thought they told me once, and I’m from a big, disorganized family, so this wasn’t as unusual as it might sound. Ever since, though, I’ve been semi-obsessive about place and aware of what it means to be without one to return to. I used to think that when I died I’d be buried under a giant oak tree in the pasture near the lake where I grew up. But now I have nowhere to be buried—which I think is the same thing as not yet having made a home that resonates in the heart as the place the body belongs to. Restless, bereft, rootless—whatever you call it, I’ve struggled to figure out how to “make a place” that feels like a genuine extension of the world where I grew my imagination and childhood. But it hasn’t happened, which is, I guess, the great lesson of place. When it’s gone, that’s it. My husband, however, can still return to the landscape of his childhood—the Oregon coast. These landscapes that call us back are as much spaces of the internal as the external, deeply informative and connective. We wanted to share this kind of connection with our daughter. When we were invited to help start a writing and arts residency program right where my husband grew up, we jumped at the chance. Not just for the place-based aspect of it, but also because it’s a very direct fit with our desires to be more fully dedicated to working together, and to making, writing, and providing creative opportunities for others. How will your residency program be different from others in Oregon like Caldera, the Sitka Center and Signal Fire? What are your hopes for Grass Mountain? Before we determine the exact shape of the program, we have a full year to live on the land, write, make art, and interview others who have done the same before us. We have a gift of time to get to know the land and the community, so that whatever we create will be responsive to the larger communities there. That said, I am interested in collaborative projects and gathering unlikely people to make stuff together, and in projects related to environmental urgency. My hopes for Grass Mountain are that it will be a place of intensive making, and that there’s an appreciation for projects that are ongoing, accumulative, sometimes portable, and reflective of multiple visions, mediums, and ways of entering into an idea.